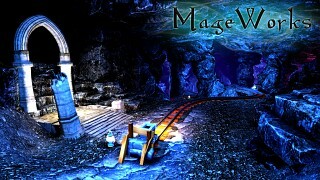 MageWorks is a project being developed for the HTC Vive (and for Oculus Touch coming soon) and is now in Early Access on SteamVR. This game is being developed with a transparent mindset and community feedback, so feel free to let me know your thoughts, comments, and criticism as the game grows! Summary: MageWorks was developed as a prototype for VR + Motion controllers in June of 2016. 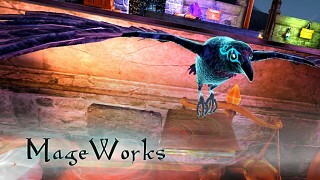 The game puts the player in the position of a mage with a spellbook in one hand and a staff in the other. 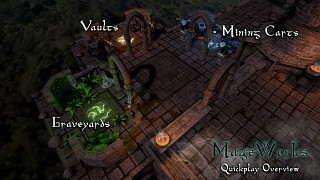 Players flip through their spellbooks and use their staff to cast the spell. 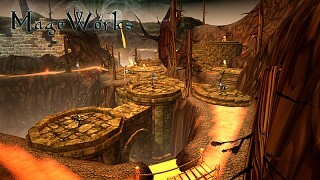 Players can also customize both their spellbooks and their staffs. 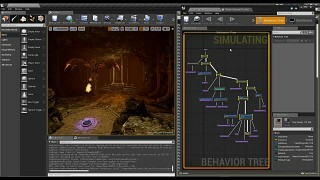 After customizing their staff using resources found in the environment, players can 3d-print their designs. Currently in Early Access, MageWorks is due for release in Summer of 2017 and is compatible with both Vive and Touch. 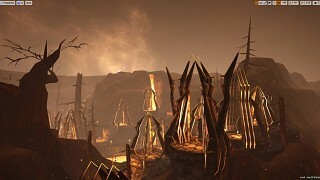 Movement: The game originally used teleporting for movement, however the community quickly requested analogue for more advanced users, so a HoverDrone was added, allowing players to step on their drone to hover around places with analogue controls. 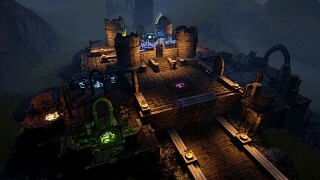 When players unlock enough spells, they will be powerful enough to fight the game's boss which is a dragon guarding a vault. Crafting: Player's will need to collect flowers to create ink. That ink can then be injected into staff drawing designs to empower their staffs unlocking additional mechanics (coming in a future build). 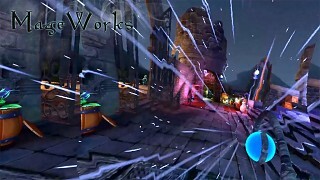 Ink can be created by using the VR motion controls to cut, mill, mix, and bottle the ink. Crystals will need to be collected, shaped and equipped to improve spell power. Wood is needed to create staff parts as well. Players can cut, shape, lathe, draw and CNC staff parts to build a staff that fits their design creativity. These custom staves can be 3D printed as well, and the files are stored in the save game directory for use with a 3D printer. Its rather strange to have a VR RPG specially since the player movement ideas are way too green at the moment for combat (you know, having to select to where to move, intead of moving naturally, feels counter instuitive), "Magical Duel" Based combats (where two mages combat each other with their spells) its other story though. 4.- If necesary, "is the spell casted on self Or on others?" 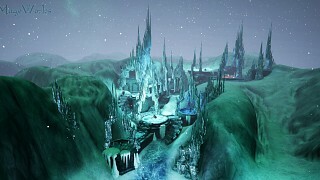 About the Schools of magics, you would consider something similar to "The elders scrolls" idea of it as its pretty acuratery for most of the spells you would add. good thoughts. so far there are two types of spell books. combat spell books and utility spell books. combat has stuff life short range, long range, burst, pet and defense. utility has things like hoverboards, flashlights, lockpicks, and portals. the way you've mapped it out would be good for spell crafting. that could be an advanced part of the game or something. or maybe DLC as an advanced spell book of crafting sorts. 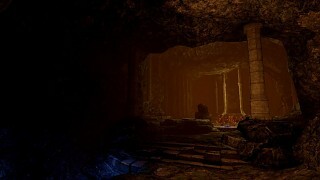 will this be rpg like for VR with a story focus or more sandbox. [ or both ]. watching now and hope it will become something interesting in the future. probably a little of both, but on the casual side. spellbook and staff crafting based on elements & spells collected in the wild. looking into ways VR could give rpg games a different flavor, so not quite sure yet. but there is an inventory system in the works. stats will probably be really basic and focus more on schools of magic rather than traditional stuff like strength, dexterity, etc. this way, people can customize their spell books based on their favorite type of magic. guess that is right, schools of magic is more realistic as a mage.